Colonel Zachary Taylor decisively defeated a sizeable Indian force near Lake Okeechobee in December 1837 and afterward, there were no more large forces were assembled on either side. With Osceola in prison, the United States was confident the war would end soon. But it did not. 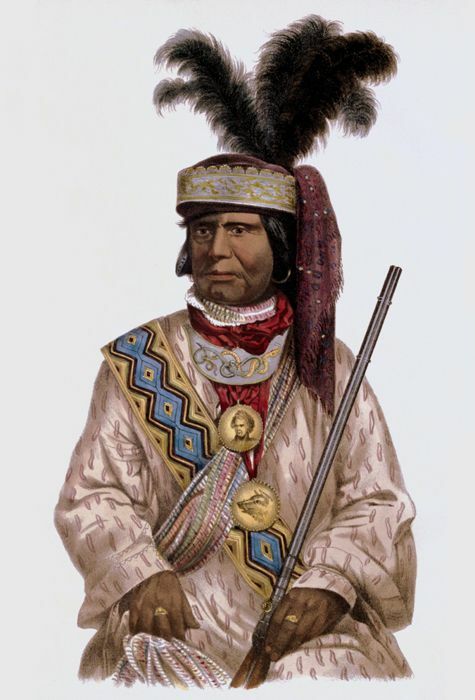 Although Osceola died in prison in 1838, other Seminole leaders kept the battle going for a few more years. 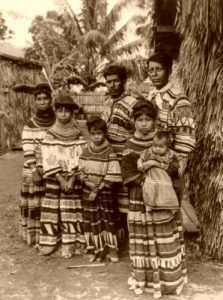 By the early 1840s, most of the Seminole population in Florida had been killed in battle, ravaged by starvation and disease, or relocated to Indian Territory. Colonel William J. Worth finally conceived a plan which consisted of campaigning during the enervating summer seasons with the object of destroying the Indian’s crops. This plan was successful in driving a sufficient number of Seminole from their swampy retreats to permit official termination of the war on May 10, 1842. However, no peace treaty was ever signed. During the long and difficult campaign, some 5,000 Regulars were employed with a loss of nearly 1,500 killed. Nearly 20,000 volunteers also participated in the war which cost some 20 million dollars and resulted in the removal of some 3,500 Seminole to the Indian Territory. However, several hundred Seminoles were allowed to remain in an unofficial reservation in southwest Florida. 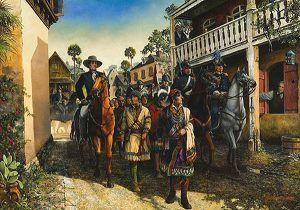 Third Seminole War (1855–1858) -This war was again the result of Seminole responding to settlers and U.S. Army scouting parties encroaching on their lands, perhaps deliberately to provoke a violent response that would result in the removal of the last of the Seminole from Florida. After an army surveying crew found and destroyed a Seminole plantation west of the Everglades in December 1855, Chief Billy Bowlegs led a raid near Fort Myers, setting off a conflict which consisted mainly of raids and reprisals, with no large battles fought. American forces tried to destroy the Seminole’ food supply, and in 1858, most of the remaining Seminole, weary of war and facing starvation, agreed to be shipped to Oklahoma in exchange for promises of safe passage and cash payments to their chiefs. An estimated 200 Seminole still refused to leave and retreated deep into the Everglades and the Big Cypress Swamp to live on land that was unwanted by white settlers. Since the war was officially over and the remaining Seminole carefully avoided contact with settlers, the government sent the militia home and reassigned most of the regular Army troops, leaving only small contingents in larger coastal forts such as Fort Brooke. Most of the smaller forts scattered across the Florida wilderness were decommissioned and soon stripped by settlers of any usable material. In the 1940s, the Seminole who remained in Florida began to move to reservations and establish official tribal governments. There are several official Seminole Tribes in Florida today. Compiled and edited by Kathy Weiser/Legends of America, updated October 2018. Seminole Indians in Miami, Keystone View Co., 1926. Click for prints, products and downloads.